Hello guys, this is Arca. Happy 4th of July Independence Day to all! And hi again, Josh. 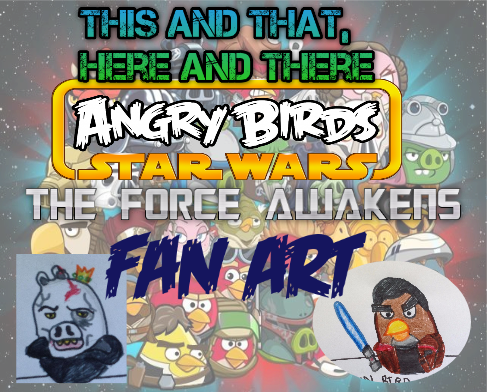 According to the last poll, the two Angry Birds Star Wars: The Force Awakens fanarts you wanted to see me do are Commander Snoke Pig and Finn Bird. So, without further ado, here they are! As you can see above, my Commander Snoke pig has white skin with grey marks all over. He has a red scar on the side of his head, and one of his eyes are swollen with a grey outline. One of his piggy ears is injured. He is wearing a king's crown (a joke and reference to King Pig from original Angry Birds), just like Emperor Palpatine Pig wore in the first two Angry Birds Star Wars games. His snout is oddly shaped, just like the shape of his head is. His eyes are yellow and so are his teeth. He is wearing a black and grey robe. 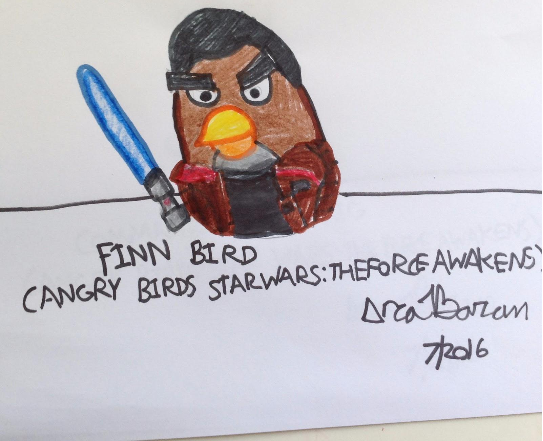 As shown above, my Finn Bird has brown skin with an oval-shaped orange and yellow beak. His eyebrows and hair are black. His hair is round and has the same hairstyle as in the movie. His stomach feathers are grey.His jacket is brown with red stripes and a grey collar. His shirt underneath is completely black. He is holding the classic Skywalker family lightsaber, which has a blue blade. I hope you enjoyed. Thanks for reading this. Stay tuned for tomorrow's post, and a post every day of the summer. I will see you next time. Happy 4th of July! BBYYYYEEEEEEEEEE!!! !